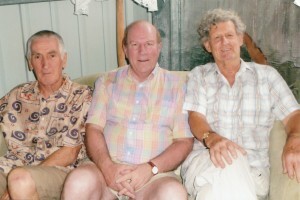 Rosemary and Lewis Hayward had invited us to their beautiful estate on the Sunshine Coast. As we are always busy, we could not give them a date. Suddenly it occured to us that October was rolling on and there was just one long weekend we could seize towards to end of the month. November and December were all booked up what with Christmas approaching. We arrived at Brisbane airport on a cloudy day! We picked up our car and drove down leisurely to Yandina. Rosemary had made us promise we would drive straight down to them in time for lunch - no stopping for snacks. It wasn't long before we arrived at this beautiful sleepy town of Bridges. The long drive to the house took me back to my past where our home was down a long winding drive bordered by Jackfruit trees and horse corrals. 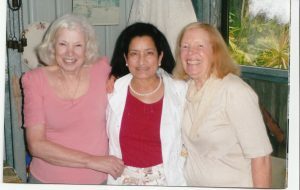 Left to right: Rosemary, Rohana and Mariamah. Rosemary and Lewis came out to greet us. Although it was slightly cloudy, it was much warmer than Melbourne. It was so lovely to meet up with our old friends. After the hot soup, cheese and bread, we sat down to a lazy chat. There was so much catching up to do as well. As it was Thursday, we had to remember that it was latihan night. So after a beautiful walk with Rosemary, we had an early dinner and left for latihan. The Subud hall was about a twenty minute drive with Rosemary or Lewis at the wheel! I was truly looking forward to meeting my old friends Mariamah and Rasunah. Everything felt so peaceful. The latihan was much needed. The latihan experience with friends who love you and are in inner harmony is truly sublime. This is worshipping God. To love your brother is to love God. Although the group is small, the feeling is harmonious. The next few days were sublime.We talked and talked. We walked round the estate. Eleven acres, some still kept as rainforest, some as bush, and the rest mowed down by Rosemary into what looks like parkland. Lewis spends most of his time planting hundreds of palms and indigenous plants, feeding and nursing them as the soil in some areas is hard and not conducive to good growth. Whilst the men chatted or watched the news and cricket, Rosemary and I walked and talked. The land was so beautiful that I used to wake up early and go for a walk - I wanted to see the two dams and listen to the birds. Rosemary and I visited the famous Yandina farmers' market early one morning. I cannot believe how long it took us to find a parking spot! Of course we missed Mariamah and Rasunah who came to shop at 6.00 a.m. I have not seen many markets, but what impressed me here was how wonderful and crisp the fruit and vegetables looked. The plants were vibrant and the produce tempting - I wanted to eat all the mangos and cheeses that I saw! Laden with goodies, we returned home. Lewis and Rosemary were later planning to drive us to the mountains to take in the sights. The views from the top were spectacular. It was a bit chilly too. Having had our fill, we climbed down as we had a rendezvous at a restaurant at Noosa. Delicious seafood. Both Lewis and Rosemary were perfect hosts. We had a wonderful time and felt very much at home. In the morning we were invited by Mariamah and Ridwan to coffee. They are an amazing couple. Full of lightness and laughter. They are both truly worshipful and understand the importance of the latihan in their life as they have both been given a second chance to good health. Rosemary and I knew that Mariamah would put on a wonderful spread. It was not going to be 'coffee'. It was going to be lunch. She is so creative. Her table looked stunning! We were all gathered together with love and harmony and there was plenty of laughter and good cheer. The Jacarandas were in bloom and reminded me that God is the Creator of all things beautiful (and the not so beautiful) and He is all loving and merciful. We are responsible to ourselves and answer only to God. This awareness was with me all the time. I had met Rasunah in Cilandak in 1969. We have kept that deep friendship going in spite of all the ups and downs. There is nothing she does not know. I suppose with doing the latihans diligently as Bapak has advised, our characters mellow. Some of the negative forces are beaten out of us, and the love and compassion for our fellow humans is also hightened. 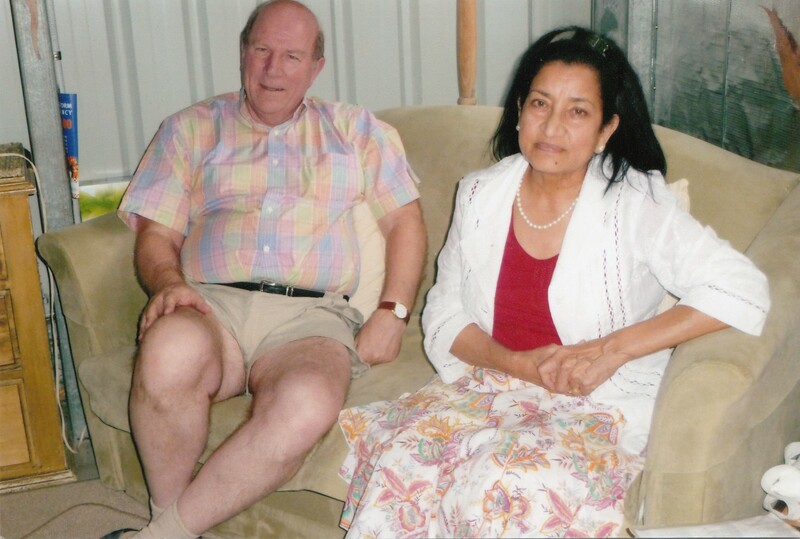 Rasunah and Latif have been our friends and supporters for many decades. It made sense to spend some time with them. So on Sunday morning after latihan at the Sunshine group, we drove down to Rasunah and Latif. We saw the new extension to the clinic and warehouse. Rasunah and Latif have been quietly beavering away at their enterprise. Their business has been growing steadily and they work extremely hard. As it was getting time for lunch, we followed Rasunah. Preparation for lunch was a joyous affair. Rosemary and I helped Rasunah pick fresh organic lettuce and herbs from her enormous kitchen garden. It was a huge dome under which grew a variety of vegetables. I discovered aubergines hugging the soil under the dense, prickly foliage. I found three just ready to be picked. Rosemary, Rasunah and I were now ready to prepare lunch. The men had gone off with Latif. In the kitchen were two large towers of ripe bananas. After the drought and not finding good bananas, this was a feast. So lunch was a harmonious gathering of friends. Rasunah is a good cook and prepares tasty food without much fuss. A feeling of warmth permeated the house. Whilst the men were waiting, Rasunah cooked the chicken, aubergines and potatoes with great panache. We were all very hungry. With a great feeling of gratitude, all of us enjoyed this wonderful repast. As we were polishing off the bananas, Rasunah cut out a huge section of the tower, which we carted to the Gold Coast for Renee. Renee and I have known each other since 1973, since before she married Ludwig. Our paths have criss crossed during Bapak's visits to Germany and Villa Rahaju in England. So a close friendship developed. I truly believe that all of us who experienced hardships when we were doing Bapak's work have an unbreakably close bond. As we all know one another well, the important part is doing our latihan and allowing God to be the ultimate judge of our actions, both good and bad. Who are we as human beings to judge one another? Have we looked at ourselves recently? Rasunah and I had experienced a little of the sixties in Cilandak. There was great wisdom in those years with Bapak to guide us. Driving up to Brisbane was a breeze. Finding Redland Bay was another story. I am very wary of Sat Nav after travelling the same road twice! Renee was so delighted to see us, having thought we were arriving the previous weekend and getting the bedroom ready! Misunderstanding the dates. I have a deep friendship with Renee and care about her health. So we both had special massage sessions on the Korean mat and on the crystals. We had a great time walking down by the 'coastline' - takes an hour on the loop. The view from Renee's patio is breath taking. I found, as we were eating her delicious quiche, a prayer rising in my heart for Ludwig. He was the architect of this beautiful light filled house. I felt very comfortable with Renee and so relaxed, I went to bed early, but left my hubby and Renee to talk well into the night. The next day the sun shone with a vengeance. Both of us were quite burnt on the patio. We were mesmerised by the birds singing and diving into the bird bath for a quick dip. The three of us sat having a late breakfast. Renee had a special treat lined up for us. She soaked the rolled oats, and then piled the bowls with papaw, blue berries, strawberries and bananas, of course! there were still plenty left in the fruit bowl. We sat around and chatted for a long time, then went for a guided tour of the house and surrounding land. Renee is a wonderful hostess. It was really a very special visit. Renee has known us for several decades. Knowing all there is to know about one another, it was just pure joy to sit and relax. It is not always what you receive but what you give in the interchange. All too soon, it was time to leave. I had packed up earlier in the day and had to throw in a few of the muddy footwear in a plastic bag before we headed out to Brisbane airport for our return journey home. As the plane descended, everybody twittered and commented on the announcement from the Captain telling us that it was raining in Melbourne and the temperature was 12 degrees. Brrr! This was Melbourne alright. Anyway, this inclement weather was not going to take the shine off the warmth of our carefree five days with our dear friends. I promised Rosemary and Lewis that I am returning for the mango season! In the meantime, there is the National Congress to look forward to. To me a Subud congress is a God given opportunity to latihan at least once everyday. An opportunity to worship God and hold that in my awareness. That is why I searched for Subud - to develop my inner, to be compassionate and allow myself to be a channel for the grace from Almighty God. 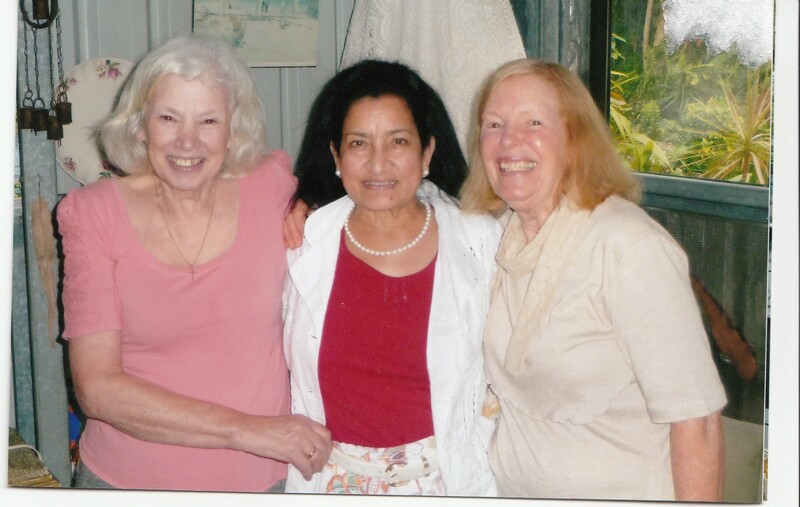 I have been in Subud for over four decades. This is my congress, and I hope to see you all there, God willing.